In Texas on Saint Patrick's Day, green is the theme, excessive behavior is the norm, and Corned Beef and Cabbage is a staple for many. Most people would not necessarily think of Irish heritage when they think of Texas, but like just about everywhere else in the country, Irish roots run deep in this state. Texas has a long Irish heritage, dating all the way back to when the first settlers migrated to the Spanish ruled colony. Hugo O'Connor was one of the first Irish settlers in Texas, and became governor ad interim in 1767. Irish settlers were significant contributors to the Texas Revolution. Close to 15 percent of the Texan forces at the battle of San Jacinto were Irish. Eleven Irishmen died at the Alamo. By 1860, the census listed over 3400 Irish-born Texans. It's safe to say that the Irish contributed significantly to the history and heritage of the state. Corned Beef and cabbage is a dish that was pretty much abandoned in Ireland in modern times, yet gained popularity and tradition for Irish Americans as a way to celebrate their heritage in a nostalgic way by eating the savory classic on the principle Irish feast day of St. Patrick's Day. While Corned Beef started out as a necessary way for Irish people to preserve meat through the winter and the Lenten fast to have an Easter feast, it has mutated into what Americans refer to as Corned Beef and Cabbage to celebrate Irish heritage in America. And you know the old saying: Everyone is Irish on Saint Patrick's Day! What is Corned Beef anyway? It has nothing to do with corn. In times long past before refrigeration coarse "corns" of salt were used to cure large amounts of meat to preserve it. If you coated the meat you wished to keep for longer periods of time with salt, you "cured" it of the diseases that would spoil the meat. The English term "corn" can loosely refer to any small particle. Without delving too far into chemistry and meat science (that I don't really know that much about), salt was discovered to have a "curing" power long ago. The salt actually dries out the meat, prohibiting to some extent spoilage from bacterial growth that requires moisture and allowing the "cured" flavors to develop. It was discovered around the turn of the twentieth century that certain types of salt allowed the meat to retain a bright pink color even when cooked, primarily sodium nitrate (also know as saltpeter.) It was later determined that this nitrate also significantly inhibited the potential for botulism growth while adding a distinct, desirable flavor. Nitrates have given way in recent years to nitrites for similar results without as much controversy. I am not a chemist, or a doctor, and I do not claim to really know what the difference is between sodium nitrate and sodium nitrite, with the exception that they are spelled almost the same and can cause some confusion. So, I am going to leave the nitrate topic alone for the rest of the article. What happens when you "corn" a slab of beef brisket? Basically, salt in high concentration on the outside of the meat causes the moisture in the meat to be drawn towards the salt and out of the meat. Naturally, some of the salt solution that is carrying flavors from the spices in the brine ends up penetrating the meat in this process, traveling towards the moisture. Yet the concentration of the salt is still greater in the brine, so the moisture continues to be drawn out of the meat. This is called osmosis. When you cook the cured corned beef, you need to use plain water or unsalted broth. The reason for this is that you want to start to reverse the curing process. The salt in the beef will draw in the water it is being cooked in, naturally bringing some of the salt back out of the beef in the cooking process. This is called reverse osmosis. This would happen if you simply soaked it in cold water as well, but we need to cook it too, so we might as well do it all at once. The cooking process also draws moisture and fat out of the meat, further carrying salt and moisture away from the meat. As you can imagine, the resulting product may be a little dry. This is why you want to use the proper cut of meat. Brisket is just right because it is a cut that requires long cooking time to break down the fat and tough connective tissue inside while allowing enough fat to remain behind to moisten the meat when the cooking is all said and done. I want to restore into common lore to some extent the Old World method of curing corned beef in a brine using simple salt and spices. I feel it is important from time to time to try and make things on your own in a traditional fashion. This gives connection to the food and understanding in a way you can't get from convenience products. The resulting product will be grayish brown in color when cooked, just like any fresh beef cooked until it is well done. Think of your home-cured corned beef as a pot roast that tastes like corned beef and be comfortable knowing it was prepared with the least complicated of all preservatives, salt. If the pink color is important to you, or if refrigerator space and/or time are at a premium for you, don't be afraid of the store bought variety of raw corned beef. Most of them use the more desirable preservatives instead of nitrates to preserve and obtain the special color and certain flavor associated with corned beef today. If they do contain nitrates, they are typically at a level much lower than they used to be, as regulated by the government. The price you will pay is about two or three times what you would pay for fresh beef brisket that you cure yourself, but that may be worth the convenience. If you are more adventurous, or just curious, try my curing recipe below. Use a large enameled or stainless steel (not aluminum or cast iron) roasting pan or crock. Mix the salt and the water and stir for several minutes until all the salt is dissolved. To test the cure for the proper amount of salt, place an uncooked egg into the brine. If the egg does not float, dissolve about cup of salt at a time, testing with the egg after each addition to see if the egg floats. When the brine passes the egg float test, combine the remaining ingredients and add the brisket. Submerge the meat using a heavy object such as another stainless steel pot or a non-porous ceramic plate or two. You want to make sure the brisket remains completely submerged at all times. Cover and refrigerate for 8 to 12 days, turning the brisket once every other day. The thicker the brisket is, the longer it will take to fully cure. If you run out of time, you can just go ahead and cook it with reasonable results after about 4 or 5 days. Remember, this technique was designed to preserve the meat, and that may not necessarily be the goal today. Prep time: 12 days; Cooking time: 5 days; Total time: 12 days. Remove the corned beef from the brine, and discard the brine. Rinse the brisket thoroughly in cold water, and allow the brisket to soak in fresh water while you prepare the remaining ingredients. Place the brisket in a pot with the beer and enough water to cover by about 1 to 2 inches. Add the above ingredients and bring to a boil. Immediately reduce the heat to a low simmer and cover. Cook for 2-3 hours or until the brisket is fork tender and pulls apart easily. Smaller thin briskets may take less time, but at least 1 hour. When the brisket is cooked, add the following ingredients in whatever quantity you want to feed people with. I would suggest 2 or 3 potatoes, 1 cabbage wedge and 1 carrot per person, plus leftovers. If you don't have enough room in the pot, you can remove the corned beef at this time and allow it to rest in a very low oven set to warm while you cook the vegetables. Peeled carrots cut into 2-inch pieces. Cook for an additional 20 minutes, or until potatoes are cooked to desired doneness. 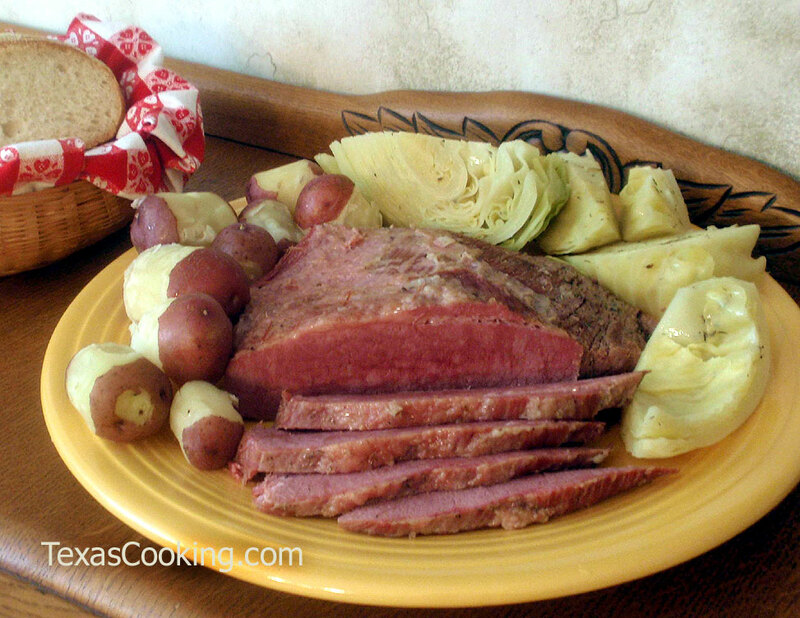 Remove the corned beef to a serving platter, and allow it to rest for 10 minutes before slicing. When serving the old style home-cured corned beef, slice it thin. It will be a little stronger in flavor, and a little saltier and more dry than you may be used to. Serve with a good bread, lots of mustard, and plenty of beer. Over medium high heat, melt the butter in the oil, and add the onion and bell pepper and sauté until they are soft. Add the potatoes and continue to cook until the potatoes are tender. Add the garlic and saut for a few minutes. Add the beef broth and the corned beef. Cook until the broth is reduced and the potatoes are very soft. Place on a piece of toast and top with a fried egg cooked how you like.